Former President Bill Clinton hugs a resident living at the William Rivera Betancourt Vocational School which was turned into an emergency shelter for families affected by the impact of Hurricane Maria, in Canovanas, Puerto Rico, Monday, Nov. 20, 2017. 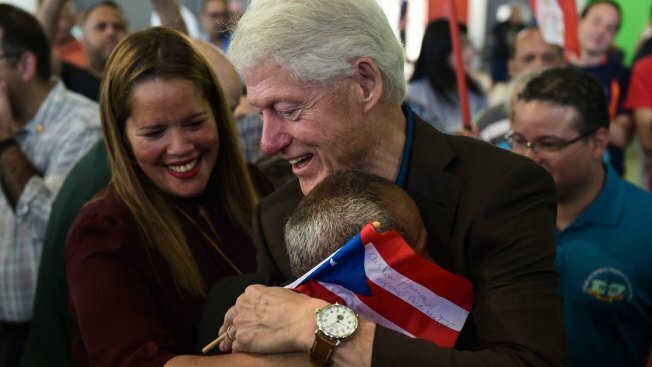 Former U.S. President Bill Clinton visited Puerto Rico on Monday and met with those left homeless after Hurricane Maria hit the U.S. territory as a Category 4 storm. Clinton arrived with medical supplies and solar energy equipment donated by the Clinton Foundation, which has already shipped 76 tons of medicine and medical equipment since the storm hit on Sept. 20. Clinton also visited health clinics and the island's largest shelter with Puerto Rico Gov. Ricardo Rossello. He was scheduled to meet with San Juan Mayor Carmen Yulin Cruz and other officials later Monday. Rossello said Clinton's visit will help people realize that Puerto Rico still needs relief supplies more than two months after the hurricane hit. "It's important to have him here because he has a vision of how to emerge from the emergency phase, establish normalcy and begin to rebuild," Rossello said. The hurricane killed at least 55 people and caused up to an estimated $95 billion in damage. More than 20 of Puerto Rico's 78 municipalities are still without power. In all just 46.6 percent of the island has power, according to Puerto Rico's government. More than 140,000 people have fled for the U.S. mainland.